Today I am grateful that gardening has taught me to appreciate other gardens. I used to sail through life without ever glancing at the beautiful gardens in my neighbourhood, without any appreciation for the time and effort put into our beautiful South African Botanical Gardens and without ever stopping to smell the roses or admire the look of a friends garden. Now I am quite obsessed with looking at other gardens and plants. A simple drive to the shops will have me reminding myself to keep my eyes on the road rather that gawking into other people’s gardens. I love admiring the different types of gardens, the various ways people lay out their gardens and the many different gardening styles. For this new appreciation of gardens, I am grateful. Photo – Sparaxis: Another South African native, I planted Sparaxis from bulb in my garden this year. Unfortunately they did not do very well. I don’t think they got nearly enough sun in my garden although I planted them in the sunniest spot I could fine. Win some, lose some, I won’t plant them again as I cannot give them the right environment for them to thrive. 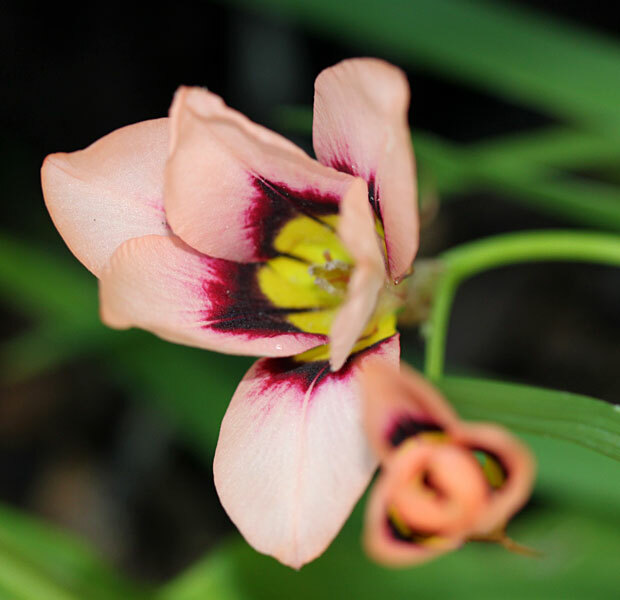 Sparaxis (Harlequin Flower) is a genus in the family Iridaceae with about 13 species endemic to Cape Province, South Africa. All are perennials that grow during the wet winter season, flower in spring and survive underground as dormant corms over summer. Their conspicuous flowers have six tepals, which in most species are equal in size and shape. It’s so true, gardening and plants really help increase your appreciate for the greenery we’re often surrounded by daily. It really enriches a walks in the city as you can gawk at other peoples beautiful and no so beautiful gardens. It teaches us to slow down a bit and “smell the roses” if you will. So true! New appreciation for what others have done in their gardens (as well as some criticism) is something that being in the garden has given me too. How could we have missed it before? Christine this is a beautiful flower…it is amazing how your perspective changes with gardening. We learn so much from observing gardens…wonderful post! that’s very true, being a gardener, modest as I can be ! makes me open my eyes on other people’s gardens, or even plant displays in cities. It’s one of the best thing to be able to share the beauty of plants so often neglected in my relatively urban environement. Great photos, unusual plants for me, the mesmerizing power of colours ! I’ll be back soon !